At the end of the day, the stat sheet says Oregon defeated Green Bay 83-72, but with two minutes to go, this game was in serious doubt. Sandy Cohen hit a three at the 2:04 mark and the Phoenix were suddenly within four at 74-70. But that would be their last field goal of the game and the Ducks would hit 9-of-10 from the charity stripe the rest of the way to seal the victory. Oregon improved to 4-1 on the season, while Green Bay dropped to 3-3. Bol Bol scored 15 of his game-high 21 points and he also led the team with nine rebounds on the night. Payton Pritchard got hot in the second half and ended with 18 points, six boards and five assists. Cohen, who is one of the best players in the Horizon League, led the Phoenix with 18 points, four rebounds and six assists. ShanQuan Hemphill added 10 with JayQuan McCloud scoring 10 points as well. 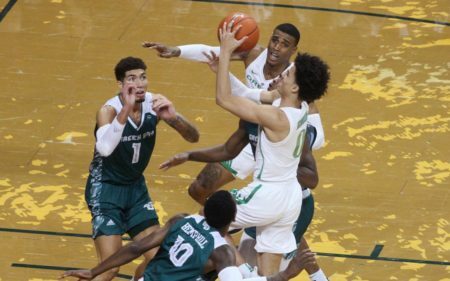 Green Bay kept itself in the game after trailing just 39-31 at halftime with some key three-pointers to remain within shouting distance of the Pac-12 favorites. The Phoenix shot 9-of-29 from long range, including 5-of-12 in the second half. The Ducks committing 13 turnovers for the game didn’t exactly help their cause. What did help their cause, however, was the ability to get to the free throw line at almost anytime and to sink those shots. 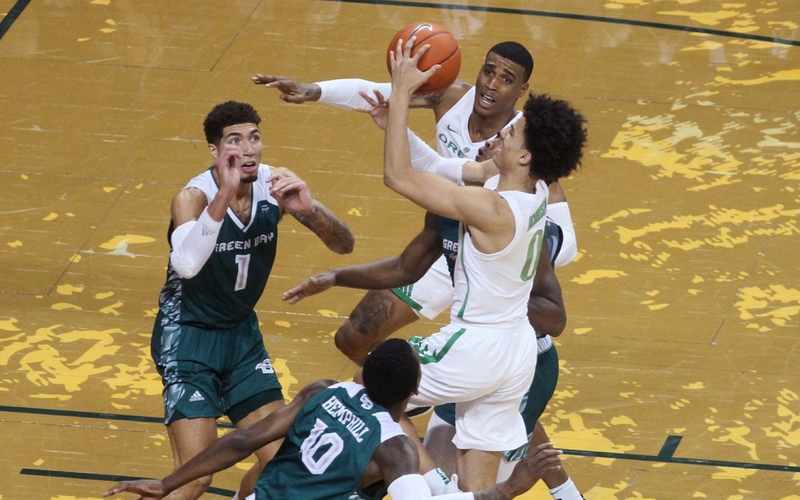 Oregon was 33-of-42 from the foul line, including 21-of-26 in the second half. Many of those key free throws were in pressure situations down the stretch. Oregon managed to keep their opponent in the game by having offensive lapses. The Ducks went scoreless during a four-minute and a five-minute stretch. Their last field goal came at the 4:33 mark when Bol hit a turnaround jumper to make it 70-62. Will Richardson and Pritchard managed to make the free throws in the last two minutes to ice the game for Oregon. Richardson finished the game with 10 points. Abu Kijab managed his best game of the season with nine points and four rebounds in just 12 minutes of action. He had three separate offensive put backs in the second half that sparked what was a feeble scoring attack. His energy seemed to get everyone else back on track. This game may have been closer than Oregon had hoped it would be, it they’ll face these situations over and over when the conference season arrives. Games will come down to who performs the best in the last two minutes and the Ducks will be thankful it got some practice this early in the season. Next on the schedule is a home date with Texas Southern, a team that is 1-4, but that one win came against Baylor to open the season. They were 16-20 last season and despite that record, the Tigers managed to win the SWAC tourney and then defeat North Carolina Central in the First Four of the NCAA tourney. One of those losses came to Oregon, a tough 74-68 contest in Eugene. Their season ended with a 102-83 loss to Xavier.